There are currently 78,325 users on this website. I just bought this Titus. On first glance it is nothing too special. It is a very common coin for Titus. However, take a closer look at the reverse. Underneath the triangular frame is a lituus. This turns out to be a rare variant of RIC 124. This type was carried over into the first issue of Domitian's coinage. RIC 3 for Domitian shows the pulvinar with the triangular frame. It is a rare coin but also has with a rare variant, a lituus under the frame. I have both of these for Domitian. For some time I have wanted the Titus variant. 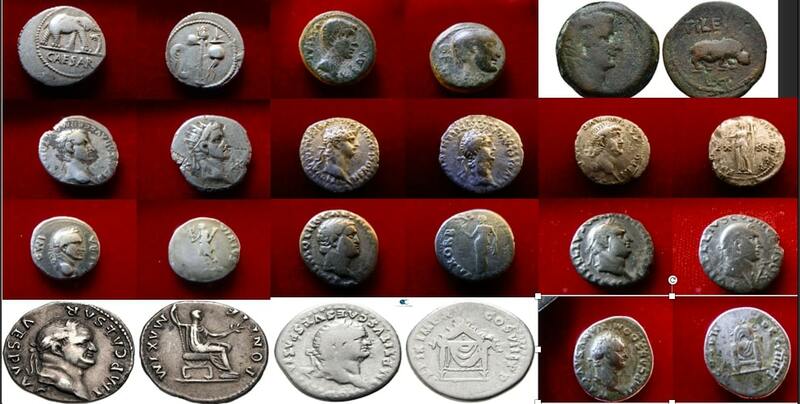 According to a friend on his forum gallery pages, there are 3 known varieties of the lituus type for Titus. One has 3 palmettes, one has five, and one has nine. Mine is the type with nine palmettes. This makes my coin RIC 124C in the yet to be published addendum to RIC II Part 1. This is a worn but still pleasing coin imho. I am very happy to add this one to my collection. As an added bonus this coin completes my 3rd 12 Caesars set. Please show your coins of Titus. Rev:TR P IX IMP XV — COS VIII P P, draped processional chair, triangular frame by decorated with nine Palmattes Lituus under triangular frame. There is no Titus in my (very small) Roman collection, but I still wanted to congratulate you on your third set of the 12 emperors. What's next? Wow a third set!, I never complete my first. Congrats. Thanks for the kind comments. As for what is next, I will probably send some time upgrading and adding interesting examples. I am seriously thinking of narrowing my collection to the 12 Caesars only and selling the rest of my collection at auction. A purge is good once in a while. Still trying to complete my first set. Congrats! Well I bought this awhile back ago as an unidentified Roman, thinking it was Vespasian. But after further examination, I've come to the conclusion that it is Titus- Although the "T" is not really visible on the legend, the space before the "C" has me fairly convinced. Also, I can see an "O" on the reverse, which could represent "PONTIF TRI POT" on the reverse, I don't see that for Vespasian. Titus Denarius. T CAES IMP VESP CENS, laureate head right / PONTIF TRI POT, Titus seated right, holding branch & sceptre. Three 12-Caesars sets. Remarkable. Congrats, Andrew! Your coin is RIC II Part 1 556 on page 99. The obverse reads T CAES IMP VESP CENS. The reverse reads PONTIF TRI POT. RIC rates the coin as common. Thanks for the kind words Bob, much appreciated.